Today, we must lay down the oppressive burden and dysfunction of “race,” and lift up, for the whole world to see, the power, the elegance, and the richness of our diversity. Hope alone does not build a city. People do. Throughout history, the people of the world have suffered greatly at the hands of natural and man-made disasters, either by earthquake, fire, or flood, oil spill. Great cities have been torn asunder, and they have been rebuilt. From Lisbon to London, to Tokyo to Tangshan, San Francisco to Chicago, great cities have transformed disasters into instruments of progress. But as the last five years have shown us, this historical narrative- of catalysts of progress- is being challenged on the shores of this nation and this great soil. We now know that progress is not inevitable, nor is it certain. It will not come on its own, and it will certainly not come without a price. Every civilization that has failed to learn the lessons of the past and failed to pay its dues properly owed has lost its place in history and will be swamped by time’s onward march. We cannot make that mistake. We will not turn away from our tasks and our time. We must change course. Change must come to this troubled yet beautiful, this impractical yet lovely, this gorgeous yet challenged place that we call home. But change, my friend, does not begin in the palace of the Pope, the halls of Congress, the rose-petaled gardens of the White House, or the marbled-walls of Wall Street boardrooms. Change- real change, transformative change, enduring change- comes from the streets. Change starts here. Change starts now. There is nothing broken here that cannot be fixed. No problem here that cannot be solved. No offense between us that cannot be forgiven. No breach or divide that cannot be repaired. The hard truth is that the path will be long and arduous; it will require sacrifice, patience, and endurance. However, during our journey we will be sustained by the knowledge that what we build will be not for ourselves but for the ages. To do anything less to walk away to refuse to engage to deny the obvious to ignore the responsibility and yet miss the opportunity that lies before us would be a sin for which we would never be able to atone. And, it all begins with one single step. The first step is to declare that we are no longer recovering no longer rebuilding. Now we are creating. Let’s stop thinking about rebuilding the city we were and start dreaming about the city we want to become. 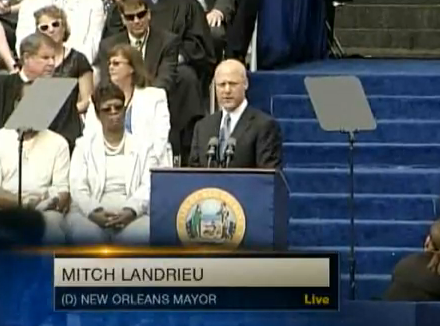 The world deserves a better New Orleans.People of New Orleans hear this – today is a new day, today is a new time.